Firstly, the Reporting Services map component doesn’t understand postcodes, so we have to convert postcodes to latitude and longitude. There are a number of ways of doing this, some more costly and/or time consuming than others. 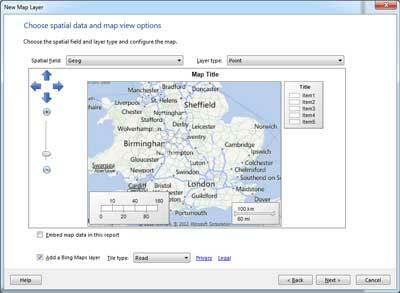 There are datasets that you can buy, or the Ordnance Survey now provide a free download of postcode and other mapping data. Read Jamie Thompson’s blog (No, not the SSIS-Junkie, another one!) for details on how to use it. [Edit: Thanks to Martin Bell for pointing out this link is now invalid, sorry!] These datasets provide full 7 digit postcode resolution, which means you can plot at the street level (approx 2 million different locations). For a number of purposes this is excessive, and using a simpler 4 digit postcode is more than adequate, which breaks the UK down into about 3000 areas. For this you can download the details here. 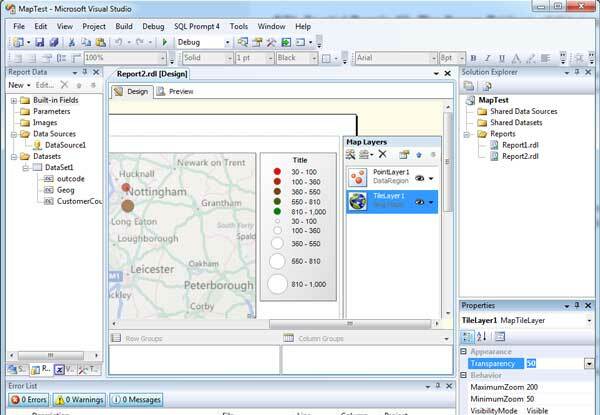 We can then use the spatial functionality introduced in SQL Server 2008 (and R2) to convert the lat/long into a geography data type, which can be displayed natively in an SSRS report. Assuming you’ve loaded the dataset above into a database table, we can join this to our existing table of customers. As our customer table has a full 7 digit postcode but our postcode table only has 4 digit, we need to simplify our customer postcode down to take only those characters before the space (convert SY1 1AA into SY1). We can do this using a LEFT and CHARINDEX, as per the code below. 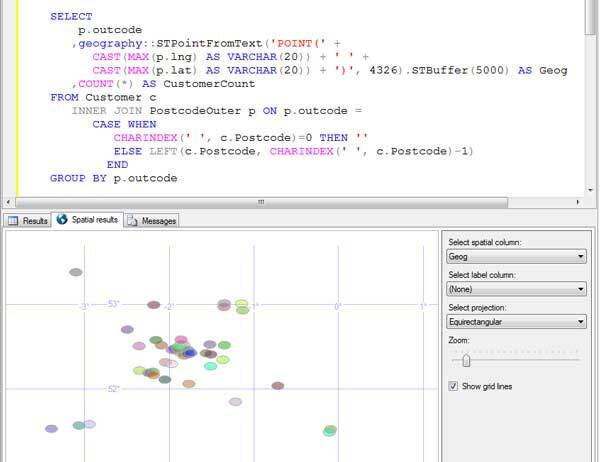 We can then join this data to the postcode table to link the lat/long to each customer. I’ve saved the postcode list in a table called PostcodeOuter. Latitude and Longitude aren’t quite enough for Reporting Services to be able to display. We need to convert them into the internal SQL Server Geography data type. We do this with the geography::STPointFromText function. Note that the 4326 is the Spatial Reference Identifier (SRID), 4326 is the default – you can just leave this as it is. We now want to join all of this together, and group the results by the post code outer code, so we can count the number of customers in each code. 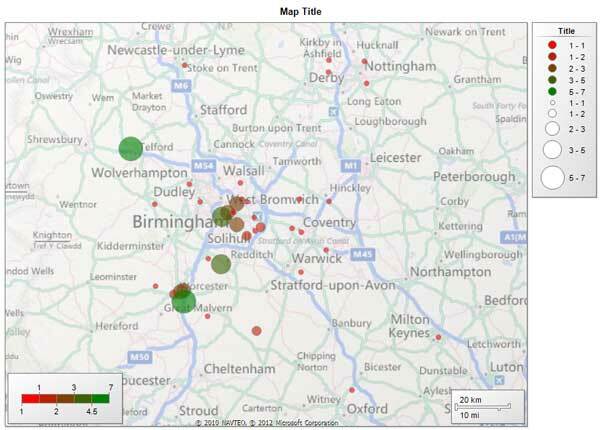 We can now put this query directly into SSRS and show the data on a map. Firstly load up BIDS, load or create a Report Server Project, and then add a new report (don’t bother using the wizard). Add a data source to your database. Use the query above as the dataset (obviously with the fields and tables modified to suit your database!). And there you have it, you can run the report and see your map. Not that tricky huh? You can then play around with the settings to change the look and feel, a good one is to set the Map layer transparency to 50, which makes the markers stand out more. But this is up to you. There’s plenty more information on the internet about spatial data, both on the Frog-Blog and elsewhere. I’d recommend taking a look at Alistair Aitchison’s Spatial blog for some really interesting stuff to do using spatial data. Thanks to Stephen Bennett for inspiring this post. I believe that a postcode will always have a 3 digit outbound part, so rather than checking there is a space you can take all but the last 3 characters (when trimmed). Pingback: Self-Service BI Mapping with Microsoft Research’s Layerscape–Part 1 - Atlas Analytics Inc. Awesome! – Really usefull and informative. A great page and well explained. I will add a link in my blog, if that is ok? How do you keep the map to show if the report server does not have net access? By all means, link away. As far as I’m aware there’s no way of caching the map data, so the client always needs to be online. If you have offline requirements then you could look at integrating into MapPoint or similar, but I’m not aware of any way to do that in SSRS. Looking at this I realised that using max latitude and max longtitude is probably not accurate since postcode regions are irregular. The combination of these two points could actually arrive at a point outside the real postcode region. Instead I got the spatial points for each postcode (the 1.7 million file) – using the technique above except for “max”. Then I created two new fields Sector_Postcode and Sector_Geog_Pt. I populated the sector postcode with left(postcode,len(postcode)-2). Hello, Need some help with the above, is anyone able to contact me on the email used? How to color bubbles from hex color value stored in the dataset?